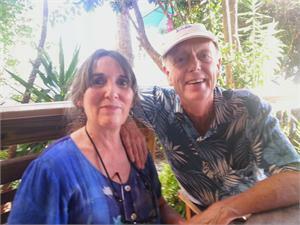 We are Robert Simmons and Kathy Helen Warner, founders and owners of Heaven and Earth LLC. We started our business as a tiny shop—a crystal and jewelry store—in 1986. The name Heaven and Earth came to us in a meditation, and it was a good fit. Much of our inventory was earthly crystals of Clear Quartz, Amethyst, Herkimer Diamonds and such, but we had heavenly stones as well. We were the first company to offer Moldavite, the translucent green meteoric gem, and we later added other celestial items such as Libyan Gold Tektites and Tibetan Black Tektites. In 1988, we published our first book, Moldavite: Starborn Stone of Transformation, and it contributed greatly to the awareness and popularity of that stone. It also launched us into the mail order trade, because people everywhere were clamoring for Moldavite. Twenty-nine years after we began, and fifty-two Heaven and Earth catalogs later, Moldavite is still a mainstay of our business, and of the metaphysical stone-lovers’ community. From our beginnings with Moldavite, we remained attuned to what crystal enthusiasts have termed “high-vibration stones.” After Moldavite came such powerful crystals as Phenacite, Danburite, Herderite, Tanzanite, Cuprite, Petalite, Lemurian Seed Crystals, Aqua Aura and Angel Aura stones, Golden Labradorite and a host of others. In 1991, in fulfillment of a prophetic vision experienced by our friend Naisha Ahsian, we discovered the stone called Azeztulite. This began our mission to spread the energies of these stones--the currents of the Nameless Light of the Great Central Sun—to people all over the world. Over the years, we have found numerous types of Azeztulite—including Pink Azeztulite, Himalaya Gold Azeztulite, Satyaloka Azeztulite, Cinnazez (Cinnabar Azeztulite), Amazez (Amethyst Azeztulite) and Sauralite (New Zealand Azeztulite)—each with its own specialized qualities. As these stones resonated with many seekers of healing and higher awareness, our reputation as a major source of high-energy stones expanded. Our company grew, and we moved several times to larger quarters, ultimately purchasing a warehouse in East Montpelier, Vermont. Our publishing work also expanded with the 1995 publication of Naisha Ahsian’s Crystal Ally Cards oracle deck and book. In 2005 we published The Book of Stones, by Robert Simmons and Naisha Ahsian—a pictorial metaphysical and scientific encyclopedia of over 300 gems, minerals and crystals. In 2009 we published Robert Simmons’ Stones of the New Consciousness, and in 2011 we published The Pocket Book of Stones. We also publish the Metaphysical Guides to the Denver and Tucson Gem and Mineral Shows each year. Heaven and Earth is, from time to time, a sponsor of events such as The Crystal Conference and Robert Simmons’ Stones of the New Consciousness Intensives. New events are now in the planning stages. Currently, our work continues in many areas. Kathy and I have relocated to New Zealand, and we are always seeking out stones that express the vibrant energies of our new home (Sauralite, Cinnazez, Empowerite and Revelation Stone are among our New Zealand discoveries). Meanwhile, our Vermont warehouse and mail order center is going full steam, and our diligent crew continues to serve our customers and friends around the world.